Look deep into the Black Crows Orb Ski and see a future filled with deep carves, fast turns, and aggressive all-mountain charging materialize from the misty realm within. Designed for skiers with a no-holds-barred approach to skiing, the Orb caters to freeskiers with a background in ski racing. With moderate camber underfoot and a flat tail, this ski excels on groomed runs and hardpack, but that's not say that it isn't afraid to pin the throttle down wind-buffed bowls and tight chutes, either.The ski's powerful and energetic flex comes courtesy of a springy poplar core and stiff Titanal laminates, which give the ski a high-performance feel when you're blasting down frontside groomers or mobbing down chopped crud. Speaking of chopped crud, Black Crows threw in an early rise tip to increase float and add some extra lift with you're testing off-piste conditions. 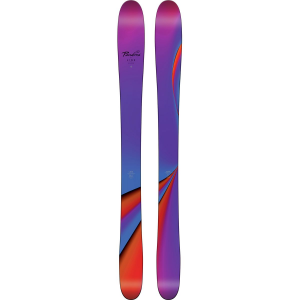 With a 91mm waist, the Orb is by no means a powder ski or dedicated carver, but more of an all-mountain ripper that will make the most of just about any condition you encounter when the last big storm was weeks ago.